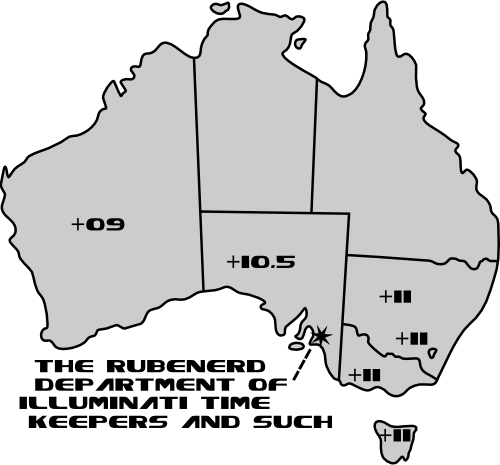 Rubenerd: Australian daylight savings has started. Free map! Australian daylight savings has started. Free map! Daylight Savings has started in most of Australia today. On a Sunday! We can't even get a break from nonsense on Sundays anymore or something! Below is a very scientific chart I created to help my Aussie readers out, as well as the official announcement information from the Australian Federal Government peoples. Daylight Saving Time is observed in New South Wales, Victoria, South Australia, Tasmania, and the Australian Capital Territory and has been synchronised across these states. Western Australia began a three year trial of daylight saving on 3 December 2006. Queensland and the Northern Territory do not observe daylight saving. Across the south-eastern states and the ACT, daylight saving for future summers begins at 2am Eastern Standard Time on the first Sunday in October and ends at 2am Eastern Standard Time (3am summer time) on the first Sunday in April. For Western Australia, daylight saving in 2008 will begin at 2am Western Standard Time on the last Sunday in October and end at 2am Western Standard Time (3am summer time) on the last Sunday in March 2009. AEST becomes Australian Eastern Daylight Time (AEDT), and clocks are advanced to UTC +11. ACST becomes Australian Central Daylight Time (ACDT), and clocks are advanced to UTC +10 ½.
AWST becomes Australian Western Daylight Time (AWDT), and clocks are advanced to UTC +9.